I don't have much experience with Vietnamese food (other than having some pho once long ago), so I had no idea about the other popular cuisine options. 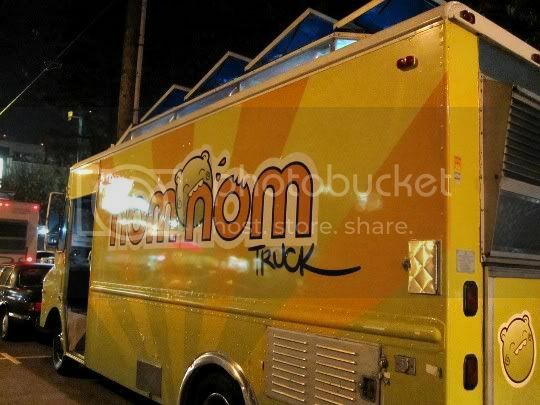 The Nom Nom Truck, a bright green mobile restaurant, doesn't serve pho...but they do serve another popular street food item. 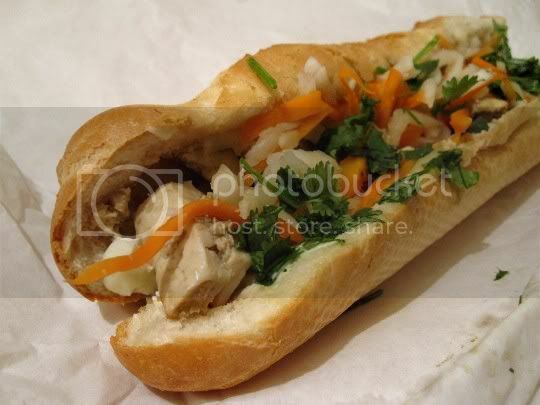 The banh mi is a Vietnamese sandwich, served on a baguette, and filled with various pickled vegetables, meat or tofu, and mayonnaise. It's an adventurous and unique meal, but if done right, it can be extremely tasty and a wonderful example of true street food. However, I was a little scared at the very odd smell coming from this sandwich. I couldn't figure it out, but it smelled scarily fishy. Did they give me the wrong sandwich? I wondered. Nevertheless, I unwrapped it to find just tofu...yet even as I opened the sandwich to examine it, I still couldn't pinpoint that stink! Anyway, this vegetarian version of the banh mi was filled with cucumber, sweet pickled carrots and daikon (a mild radish), cilantro, fresh lemongrass, tofu, and mayonnaise. The veggies were wonderful, fresh and crunchy. The lemongrass added such a strong citrusy herbal element, but it was a nice change of pace...if you've never used lemongrass in cooking, try it! The tofu was rather bland and seemed a little wet and mushy, as if they used a soft tofu instead of firm or extra-firm. The mayonnaise was extra creamy and salty, a great contrast to the sweet and crunchy veggies. And the bread was your standard French roll type, but it worked well to hold everything together. For $5, this thing was probably about a foot long...so well worth the price! Follow again? I suppose, although there are other Vietnamese trucks out there... But I'll have to try the Nom Nom tacos. That stinky smell is the smell of fish sauce, which is a common ingredient in Vietnamese cuisine. As of 6/2/11, Nom Nom Truck themselves assured me that they don't use fish sauce in their tofu. Maybe it was just a bad day LOL.